One of the reason I collect coins and write this blog is that I find coins interesting, regardless of whether they are modern or otherwise. I do not have to collect a particular coin type to be fascinated by them. Although I do not collect Euro coins, I am fascinated by the bi-metallic 1 and 2 Euro coins. As with all Euro coins, the common reverse side shows its value and depicts a map of Europe representing the entire Eurozone. The obverse has what is called the “national side,” the side each member nation customizes to represent their unique place in the world. Some countries, like Belgium, uses the same design on all of their coins while others use different designs. While all Euro coins are made of base metals, the 1 and 2 Euro coins are bi-metallic. For the 1 Euro coin, the inner part is made of copper-nickel with a silvery color while the outer part is made of a nickel brass and has a golden-like color. The composition is reversed for the 2 Euro coin. 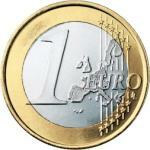 The edge of the 1 Euro coin consist of alternating segments, three smooth, three finely ribbed. The edge of the 2 Euro coin is finely milled with lettering that varies by nation, the same as the obverse. What I find fascinating is that both metals are made separately but when they are struck, the design overlaps both metals and the striking process fuses the metals together. It was fascinating since I never thought about how the one and two Euro coins were until I came across a video show how the 2 Euro coins are made. All images courtesy of Wikimedia.